It had been so long since I last read one of these books, I was convinced I didn’t remember anything about the series. Luckily, I could remember two plotlines and had only read two previous books, so apparently I’m okay after all. But still, there’s a noteworthy gap, and I’ll be more careful in the future. So, anyway, Jack, right? I’m not sure whether I should care about the ongoing plot of his personal arc, since it is so obviously a low-key romp with little or no seriousness or long-term impact, but it was certainly visible that he was mostly hijinx with brief reminders of the plot tacked on this time instead of the plot itself. The hijinx revolved around getting a slightly clearer picture of his place in fabledom as well as of his history, while only incrementally advancing the potential long term plot via the clarification of powers above the fables and via hints about Jack’s son, if such a creature still exists. But then there was a thing that made no sense at all, and it was the title. Unexpected cloning, sure, potential Fable Creators, okay, more devil-dealing than you can shake a pointed stick at, absolutely. But if there was any kind of prince buried in the book, much less a particularly bad one? I’ll eat my hat. And I can assure you, it’s a fantastic hat that I would regret losing quite apart from the digestive issues. The truth is, this book makes me question that assumption for the first time. We’ll see I guess! Spoiler alert: I’m betting yes. This entry was posted in Words and tagged fantasy, graphic novel on November 30, 2011 by Chris. Nominally, Ultimate Fallout is about the world’s (and especially the enhanced community’s) reactions to the death of Spider-Man. The nominalization is strong enough that the collection was put under the imprint of that particular storyline, in fact. And I’m okay with that, it was a big enough deal to deserve an entire one-shot run’s worth of reactions, much like the Requiem that followed the Ultimatum event. But it’s also (as partially evidenced by the multiple authors who not-coincidentally are the authors of the three concurrent ongoing series (Spider-Man, Ultimates, and X-Men) that are starting up next) the end of the bridge between the first and second runs of the Ultimate Marvel universe, and as such, there are a lot of things that happen. I mean, really a lot of thing. Pretty much, all the things happen in this book. Just like Requiem set up the way the world was going to look after Magneto’s Ultimatum, Fallout finally ties together the randomly wandering threads of the last couple of years’ events and sets up a much tighter future. This guy Mike that I know called it a reboot, and while I wasn’t prepared to agree with him before I read the book, now I’d say that everything between the Ultimatum and now was a glacially slow reboot that has finally been realized. Because, like I say, a lot of ground got covered in here. Too much to speak of more than I have in the premise statement I made above, but I can toss out several sense impressions. May Parker is still and forever the most improved character from the original Marvel continuity. She’s been incredibly fun to read at every turn, and I anticipate missing her nearly as much as I miss her nephew. She’s frequently cooler than Nick Fury, and I don’t care how much Samuel L. Jackson cachet they lent him. That said, I’ve never liked Nick Fury more than I do today, and I like him quite a lot on average. I’m still skeptical of the world’s newest apparent supervillain. I’m really, really excited to read the X-Men stuff, as it will almost certainly have the best forthcoming storyline. And as for Captain America, I provisionally like him better than I ever have too, although even if I’m right about that guess, he still won’t have been worth it. That’s all for now, though. More next year! This entry was posted in Words and tagged graphic novel, Marvel, superheroes, Ultimate Series on November 30, 2011 by Chris. Naturally, of course, the book proceeds to be only partially about that. Mostly, it’s about an (only slightly nostalgia-tinged) trip through the late ’50s and early ’60s filled with the same ratios of horrible and wonderful people that exist everywhen and with the consequences of impossible choices. What King gets right (really, what I think he always gets right and is least appreciated for) is the characters. They are always painfully honest and painfully real. Nobody, not even the wifebeater who apparently shot the President, comes off as irredeemable. And nobody, not even the man who plans to give up five years of his life just on the odds that he can prevent the assassination and that doing so might make the world better, is faultless. Typing it out, that sounds trivial and necessary in any worthwhile story, but I guess I am more talking about the unflinching way he portrays the horribleness that lurks in the best people and the basic decency and love that exists in the very worst people. What he gets wrong? I mean, obviously I’m going to trust his historical research, because I don’t have that kind of time. The other things are towards the end of the book and are pretty subjective. Also, due to their placement, they are spoilers, but I still want to talk about them, so see you in the first comment! The most trivial of internet research has revealed the preceding statements to be untrue. But after April? Nothing. Why would you do that? That’s stupid. 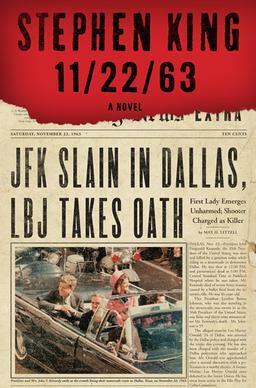 This entry was posted in Words and tagged historical fiction, science fiction on November 30, 2011 by Chris. Later, I saw the big 3D event movie of the season, which balanced its time between being in your face with 3D actiony combat (not ever over the top, though …well, I mean, the 3D wasn’t; the action very explicitly was, over and over again) and feeling very naturalistic, enough that I had to pause and think about whether there was a 3D image in front of me. Not unlike real life, you understand. So that’s probably good, right? Or I’m jaded, like I said earlier. Definitely one of those. Immortals pits Theseus against rampaging conqueror Mickey Rourke, in the hopes that he can stop Mickey from unleashing the titans who would then destroy humanity and the gods alike. (They are grumpy for having been trapped all this time, you know?) Normally, the gods would just smack Mickey down like they used to do, but apparently somewhere along the way hubris became more socially acceptable or else the gods learned about the Prime Directive. So it’s up to Theseus and his plucky peasant know-how and his tragic, revenge-inducing backstory to save the day. Of course he’ll be assisted by a number of rapidly dying allies and Sexina the Oracle, because this is after all a Greek mythological quest movie, and that is how they roll. To preserve an air of mystery, I will not spoil the presence or absence of a minotaur somewhere along the way. But seriously, everything is pretty (though perhaps a little monochromatic) and lushly over the top, like a peach that’s just gone overripe and this is more bad than good, except without the sexual connotations of that particular metaphor. If you like things that are Greek or things that make limbs roll or things that make heads explode, either watch this one, or travel 18 months along the timeline and watch the next / previous one, because really, this is the kind of movie that comes along once in a lifetime. If you are a betta. This entry was posted in Film and tagged 3D, action on November 13, 2011 by Chris. I saw a couple of 3D movies over the course of my weekend, and I’m coming to the conclusion that they need to reduce the markup. It’s not that I have the thing where it looks bad to me that so many people seem to have, it looks fine. But the thing is… it looks fine. It looks normal. I am perhaps jaded? But I sometimes have to pause and remember that what I’m watching is actually 3D, except for the times when they are going out of their way to make it obvious. On the bright side(? ), the latest Harold & Kumar sequel went so far out of its way that it might have come all the way around to accidental 3D hyperbole. As far as the flick itself, you know what you expect from the boys at this point, I reckon. But, in case, here is what you should expect: Cheech & Chong for the new millennium, complete with gratuitous T&A, more drug use than you can shake a stick at, random violence, and an outsized version of Neil Patrick Harris. And of course we get all of these things in abundance, plus they… well, they don’t learn the true meaning of Christmas, but they do learn a valuable lesson about friendship, family, and responsibility. Honestly, the presentation is a lot better than that sounds, but then again, it would be. The people behind this movie grew up with afterschool specials, of course they’re going to subvert them in entertaining ways! As far as the Christmas theme? It’s still not as good as National Lampoon’s Christmas Vacation, because, how? But it’s the only other Christmas-themed entry in an ongoing series of movies that I would bother to recommend to people. Probably because of how irrelevant Christmas-as-a-theme really was in the scheme of things; it was setting, at best. So no worries on that account. And anyway, there’s a WaffleBot, which would be worth the rest of the movie all by itself, probably even if it had felt cloyingly Christmasy. This entry was posted in Film and tagged 3D, comedy on November 13, 2011 by Chris. There are two serious upsides to the new Ultimate X book that came out last week. (And man, do I ever hope it’s a series rather than a one-shot.) The first is pretty obvious, really: the whole “all mutants are terrorists and must turn themselves in to the government or be shot on sight” decree that followed Magneto’s destruction of Manhattan means that lots of characters I am invested in have been flying way under the radar for months, and it’s nice to start getting an inkling of how they are doing. The second has more to do with timing. This entry was posted in Words and tagged graphic novel, Marvel, superheroes, Ultimate Series on November 7, 2011 by Chris. Cycle of the Werewolf feels very similar to the kid-book version of ‘Salem’s Lot. Very few of the characters get a great deal of screen time, because the town of Tarker’s Mills is really the main character. And of course it’s impossible to avoid noticing the vampire / werewolf parallel. Even though it feels like a kid-book and probably reads like one for the most part (a couple of exceptions push it up to PG-13 effortlessly), the illustrations would almost certainly keep you from letting it pass as a bedtime story. That said, if you take it as a kid-book written for adults, it’s a pretty decent short story, and let me tell you, the implied Three Little Pigs joke is worth the whole thing, even if I hadn’t liked it otherwise. This entry was posted in Words and tagged horror on November 6, 2011 by Chris. Sure, the movie too, but there is something downright unsettling about silent closing credits. Of course, maybe that’s only true if the movie was unsettling first. It’s cool, though, Paranormal Activity 3 was. Remember how there was a demon afflicted family in 2008, these sisters who had boyfriends that liked to film the creepy stuff that was going on around them and they made vague references to similarly creepy things that happened to them when they were kids? Well, that’s a fact. If anything, stuff was sufficiently creepy as to make me wonder if I should go back, watch the original two films, and try to find continuity errors, because seriously, these people lead severely fucked up lives that they maybe should have been willing to talk about a little bit more, maybe to therapists and exorcists? It wasn’t as good as either of those movies, alas, but really I’m completely a slave to the first person camera horror genre at this point, so I’ll see it no matter how bad I expect it to be or, indeed, am told it is by trustworthy people. Still, now that I have squandered any shred of credibility, I thought this was still pretty good. This entry was posted in Film and tagged horror on November 3, 2011 by Chris. There just aren’t any words. Which I suppose I’m going to have to get over quickly, all things considered. It’s just that I haven’t been hit this hard by a character’s death since, well, every time I re-read The Fires of Heaven. But there’s still almost nothing to say. I mean, I can’t talk about the plot, because the title (frankly, the last several titles) gives away far too much as it stands, and anything I might add to plot details after that would take away even more strongly from the experience. But then again, Moiraine’s death didn’t hit me nearly as hard the first time, because of the shock, so maybe they knew what they were doing. (Maybe not, too, because I’m sure it wasn’t broadly announced on the monthly schedule. Still, all I can go with is what I was given, you know?) The upshot of all this? I do have words, but they are not really that different from the words I already had. Peter Parker is an astoundingly brave and moral character who improves everyone around him, and this book tells… you know, it doesn’t tell a powerful story. It simply tells the latest chapter in an incredibly powerful and almost certainly wildly underrated story. I think it also makes a huge mistake, but I suppose that remains to be seen. Also, Joyce in The Body, but that’s not the same thing, my sadness is for the ones she left behind, not for her loss itself. Unlike The Body, I didn’t cry. But I bet I would if I ever read through these books again. It absolutely hurts. This entry was posted in Words and tagged graphic novel, Marvel, superheroes, Ultimate Series on November 3, 2011 by Chris. 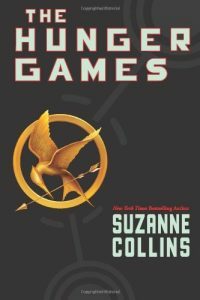 A forthcoming movie announcement led to a few people (my former roommate decidedly not among them) raving about The Hunger Games trilogy, which I had never heard of before that moment. This is understandable, since it’s written under the auspices of the young adult section of ye olde bookestores, which I have not often entered in this post- Harry Potter world. But all the same, a dystopian future America with hidden secrets in which teens are randomly selected every year to compete in a fight to the death, all so that the Capitol can flex its muscles over the 12 districts? It’s like someone watched Battle Royale and decided to rewrite it so that backstory would make sense. Obviously, once someone got around to telling me about it I wanted to read it for myself! So, cool setting, cool plot, interesting narrator, and if the rest of the characters were just a little beyond two-dimensional at best, well, that didn’t bother me through the voice of this particular narrator. It might in the movie, but then again, the characters in the movie might have more depth. All that matters for now is, y’know, this was a pretty good book! I should find the next one, eh? Enough to make me wonder how they can adapt this young adult book as anything but an R-rated festival of violence without changing a lot of things during the Games themselves. I shouldn’t care about that, but, well, you saw the Battle Royale reference earlier, right? Well, okay, and a third problem, not so much for me but maybe for you if you are not in fact a teenaged reader, which I expect you will not be if you’re reading this particular review, is the occasionally awkward “Who do I really like, if anyone?” or “What will my first kiss be like?” folderol that when you get right down to it are the only parts of the book that felt like they were aimed at a young adult audience, and I almost wonder if they were conceived after the fact to get the book into this particular… genre? That doesn’t seem like it should be the right word. This entry was posted in Words and tagged science fiction, young adult on November 3, 2011 by Chris.